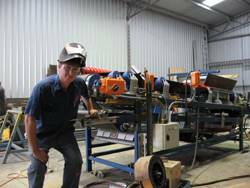 Kinder & Co has long been known as a leader in the bulk materials handling industry in Australia, never standing in the way of progress either for themselves or their customers. 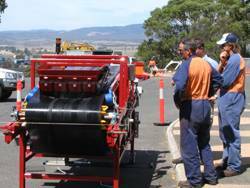 Designed and built by the company and weighing in at about two and a half tonnes, the “Kinder Conveyor Road Show” is a trailer-mounted conveyor that can easily be towed by a ute or small truck. 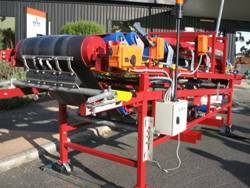 Once on site, it can be quickly set up to run and demonstrate all the latest conveyor technology available from the company. The Road Show has recently returned from a six-week tour of Queensland, where it attracted quite an audience at each of its many stops. “The idea is to give as many people as possible from each of our customers, the opportunity to experience the equipment during each stop” Neil Kinder added. Kinder & Co has always had a philosophy of sharing knowledge with their clients. This innovative new marketing concept takes this philosophy to the next level and keeps Kinder’s clients at the forefront of conveyor technology.